AKRON, Ohio – The Goodyear Tyre & Rubber Company today unveiled an all-new, state-of-the-art version of its world-famous icon, the Goodyear Blimp. The new airship is larger, faster, and more maneuverable and builds on the company’s legacy as the world’s leading builder and operator of airships. Every Goodyear blimp needs a name and, once again, the company is inviting the public to participate in a Goodyear “Name the Blimp” contest. Entrants over 18 years of age in the United States and Washington, DC can submit a name for the new blimp by visiting www.Goodyear.com/NametheBlimp or www.Facebook.com/GoodyearBlimp. One name will be chosen from the entries and the contest winner will join the Goodyear Blimp for a day of airship activities. In addition, nine runner-up winners will receive a set of Goodyear tyres. The contest opens on Friday, March 14 at 9 a.m. EST and will close on Friday, April 4. Goodyear is one of the world’s largest tyre companies. It employs about 69,000 people and manufactures its products in 52 facilities in 22 countries around the world. Its two Innovation Centers in Akron, Ohio and Colmar-Berg, Luxembourg strive to develop state-of-the-art products and services that set the technology and performance standard for the industry. 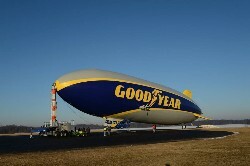 For more information about Goodyear and its products, go to www.goodyear.com/corporate.